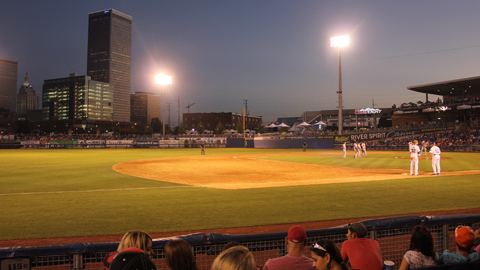 McElroy Make-A-Difference Mondays will provide nights out at ONEOK Field in downtown Tulsa for needy kids and families this season. The six Monday night games of the 2013 season will give Tulsa area children and families in need the opportunity to attend games at no cost. McElroy Manufacturing, through its partnership, will provide complimentary Drillers Dogs and soft drinks for all kids and parents that attend a Monday game as part of the program. ONEOK, Tulsa Federal Credit Union and Clinical Profusion Systems have also joined the Tulsa Drillers Foundation in the Make-A-Difference program as ticket sponsors. Any company or individual interested in helping to underwrite tickets for those in need can contact Kara Biden with the Drillers at (918)744-5901. IronPigs Charities presented by The Air Production Foundation, a non-profit organization striving to provide educational and recreational opportunities for children in the Greater Lehigh Valley area, will award a total of $85,700 in cash grants to 20 non-profit organizations during Thursday’s sold-out Phillies Winter Banquet featuring 1,100 guests at the Sands Events Center. Since debuting in 2007, IronPigs Charities has contributed a total in excess of $550,000 in cash grants and $215,000 in in-kind donations to dozens of local non-profit entities. One of the annual highlights of the Winter Banquet event is the distribution of grants to local non-profit organizations. In fact, over $280,000 has been distributed at this event alone since debuting in 2008. Allentown School District Foundation: An after-school intra-district middle school baseball program will be started in Allentown School District. At current, the Allentown School District does not have a baseball program at the middle school level. This program will allow for dozens of 6th, 7th and 8th graders to play baseball. Boys and Girls Club of Bethlehem: Mind, Body and Soul are the three components of the Triple Play program. The multi-faceted program is designed to help young people become healthy and active while forming new relationships. Boys and Girls Club of Easton: The Triple Play program consisting of the Mind, Body & Soul components, addresses a need for low-income youth to get more structured exercise in sports, explore healthy nutrition and learn social skills. Community Bike Works: Children participate in a three month “Earn a Bike” program in which they receive instruction on bike mechanics, bike safety, employment skills and business concepts. At the successful conclusion of the program they earn a bike and a helmet. Easton Police Athletic League: New uniforms and equipment will be purchased for the Easton Police Athletic League’s wrestling program. This program serves 50 youth from the Easton area. Family YMCA of Easton, Phillipsburg & Vicinity: The Family YMCA Summer Youth Basketball League serves boys and girls ages 8 to 18. This program supports 80 youth and focuses on low income families. Friends of the Allentown Parks: The Queen of the Court will give girls in the city of Allentown the opportunity to play basketball. Nearly 100 girls are expected to participate in the four week program. Lehigh County Conference of Churches: The Aspires mentoring program addresses the health and wellness of at-risk youth in the Allentown School District. The IronPigs Charities grant will fund ten weeks of recreational and educational group activities. Lehigh County Youth Association: LCYA serves over 100 youth who participate in a variety of sports, including baseball. The IronPigs Charities grant will provide new catchers equipment, a pitching machine, new bases as well as field maintenance equipment. Lehigh Valley Zoo: The Lehigh Valley Zoo’s Wildlife & Wellness Program is a nature inspired health and fitness after-school program to benefit primarily disadvantaged, school-age youth in our community. Lower Macungie Youth Association: After receiving a 2012 grant for field maintenance related items, Lower Macungie Youth Association will now receive funding for a storage shed for the items that were purchased last year. Mikayla’s Voice: This June, Mikayla’s Voice will be hosting a one-of-a-kind triathlon for children with and without disabilities. Children with physical disabilities will participate in all three phases of a triathlon with a little help from their friends. Miracle League of the Lehigh Valley: Their mission is to provide an all-inclusive baseball program for children with various special needs. The IronPigs Charities grant will provide uniforms and equipment for the nearly 300 players in the league. Pediatric Cancer Foundation of the Lehigh Valley: Golden Dippers Ice Cream Parties will take place at the Children’s Hospital at Lehigh Valley Health Network for children battling cancer who are hospitalized. Additionally, PCFLV will celebrate the end of chemotherapy treatments with a Last Round of Chemo party. Sacred Heart Hospital: An afternoon program of health and wellness will provide over 400 low-income youth with fitness activities, healthy snacks, fresh fruits and vegetables and a backpack giveaway filled with school supplies. Salvation Army: The Breaking Barriers Fitness Camp will teach youngsters how to get fit, how the body works and the importance of living a healthy lifestyle. Each child will receive a personalized workout routine after the instructional sessions. Special Olympics Lehigh County: A full course of track and field events will be setup for over 500 Special Olympics Athletes at Whitehall High School. Valley Youth House: Valley Youth House will be building “Pigtown” as the fifth element of the adventure course at Camp Fowler. Throughout the year nearly 850 youth will participate in the adventure course. YWCA of Bethlehem: The YWCA will give over 50 girls the opportunity to learn the game of golf. Held at Southmoore Golf Course and Wedgewood Golf Course, the young women will learn the necessary skills needed to play in tournaments throughout the area. Philadelphia Phillies general manager Ruben Amaro, Jr., manager Charlie Manuel along with Dave Brundage (IronPigs manager), C Erik Kratz and INF Kevin Frandsen headline the sold-out 2013 Phillies Winter Banquet presented by The Air Products Foundation, Coca-Cola and the Lehigh Valley Health Network to be held on Thursday at the brand-new Sands Events Center in Bethlehem. Other Phillies dignitaries include Benny Looper (Asst. GM), Joe Jordan (Dir., Player Development) and Steve Noworyta (Asst. Dir., Player Development). The Phillies Winter Banquet beneficiary, IronPigs Charities, is a recognized 501(c) (3) non-profit organization on the state and federal level. MOOSIC, Pa. – The public said it wanted to be involved with the new PNC Field. The depths of that yearning are still being realized. The Scranton/Wilkes-Barre RailRiders’ Community Organization of the Night Program was announced just last week. In 6 ½ business days, all 72 available nights were claimed by non-profit groups that benefit NEPA. The 72 non-profit groups, one for each home game, will receive a tip of the cap and more throughout the 2013 season. The groups chosen will own the night on the front porch of NEPA. In addition to receiving four free field reserve seats, each group will also have a concourse table allowing it to pass out information on its organization and cause. Beyond that personal face-to-face time, each group will be have a live pre-game interview on the field that will be shown to all in attendance on PNC Field’s state-of-the-art video board. The message will be further spread with a live in-game interview on the RailRiders’ radio broadcast. The Community Organization of the Night receives other perks like a ceremonial first pitch, its logo getting some time to shine on the video board and most of all, the chance to interact with the very folks touched by its efforts. The RailRiders’ 2013 season gets underway with the grand opening of a reconstructed PNC Field on April 4 when the defending IL champion Pawtucket Red Sox come to town for a rematch of their 2012 playoff clash with SWB. It will mark the first “Thirsty Thursday” promotion of the year with $1 beer specials and $1 Pepsi products along with a pre-game live band performance and post-game fireworks. Club seating, partial and full-season ticket plans are now available. This summer the San Antonio Food bank will be feeding 7,000 children every day over 11 weeks during the summer at 150 feeding sites. 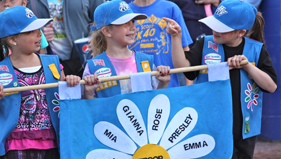 These kids need your help, and we can make it easy for you! 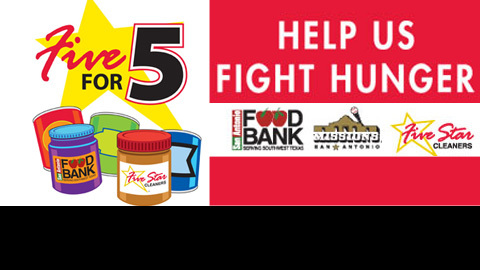 Five Star Cleaners and Your San Antonio Missions invite you and your neighbors to join us in our Five for 5 summer food drive. It runs now through August 17th. We are asking you to bring 5 cans of food to any of the 18 convenient Five Star Cleaners locations. On Sunday, July 15th…if you bring 2 cans of food here to the ballpark, we’ll give you a voucher for BUY ONE TICKET, GET ONE TICKET FREE for that night’s game against the Midland Rockhounds. So, jump our team and be a part of Five for 5. You’ll be glad you did, and you can take pride in knowing that you are helping San Antonio’s under-privileged children. This article originally appeared on the official website of the San Antonio Missions. Click here to view the original story. The Drive’s mission and goals go deeper than simply providing a postive entertainment experience. The Drive brand has been built around a commitment to being a part of the fabric of the community, and that community includes many individuals who rarely ever have the opportunity to enjoy the fun of a game at Fluor Field. All around the ballpark and across Greenville, there are children and adults who face quality of life challenges as fundamental as having hte basic physical necessities and emotional support then need to even begin to enjoy life. One very meaningful and important way that the Drive demonstrates our concern for our Community, beyond the fences of Fluor Field, is through the United Way. The United Way is a vital source of financial support for numerous charitable organizations who meet critical needs in the lives of people here in Greenville County, many of whom live right in our own neighborhood. Once again, the Drive front office is participating in the United Way of Greenville County’s fundraising campaign. Please watch the video below, and consider making a pledge to the United Way of Greenville County by clicking here. TROY, NY- As the Tri-City ValleyCats prepare to usher in a new season of affordable family fun and professional baseball to the Capital Region, they will be teaming up once again with BlueShield of Northeastern New York on the Community Grounds Crew and the 3rd Annual ‘4 in 24’ Youth Field Renovation Program. In a 24 hour time period, four chosen youth fields will have new sod placed on their infield while also seeing their pitcher’s mound and homeplate areas rebuilt. The simultaneous renovations are scheduled to take place on Friday, April 12. The ‘4 in 24′ is the kick-off event for the Community Grounds Crew, an expanded initiative with the assistance from BlueShield of Northeastern New York. This program will undertake additional projects and renovations on numerous other youth fields throughout the spring and summer. The ValleyCats’ field renovations have been an annual tradition since 2003 when the first field was officially renovated by the ‘Cats in South Troy, just one mile away from Joseph L. Bruno Stadium. Each year since, they have expanded upon its success. In 2011 the ‘Cats created the ambitious ‘4 in 24’ project to renovate four youth playing fields in the course of just a 24 hour time period, something totally unique to any field renovation initiative in the country. Each project is also supported by the New York-Penn League Charitable Foundation. Contributions come from past events such as the Capital Region Craft Brewers Festival, hosted by the ValleyCats and Brown’s Brewing Company, and the Corporate Cup Tournaments which have included teams from local and regional businesses. 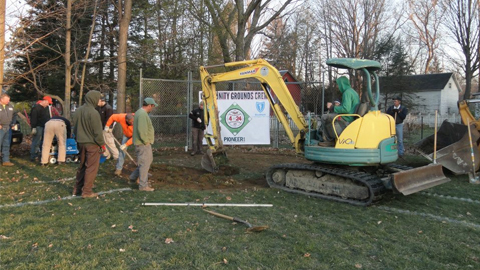 Leagues interested in having their field considered for the ‘4 in 24’ or other Community Grounds Crew renovations must complete an application that can be found on the ValleyCats website, www.tcvalleycats.com. In order to be eligible for the ‘4 in 24’ renovation, applications must be returned by Friday, February 22. Those submitted beyond that date or not selected for the ‘4 in 24’ will remain in consideration for the Community Grounds Crew program, which will accept and evaluate applications on an on-going basis. Mud Hens players score smiles with local kids! Founded by 14-year-old Touré McCord II, Books 4 Buddies encourages children and teenagers, especially boys, to read for pleasure and personal development. 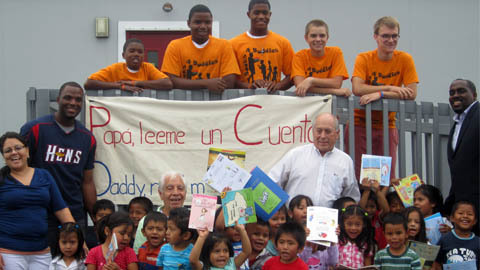 A native of the Dominican Republic, Ciriaco read two Spanish language books to the children & assisted with a free book distribution for the children and their families. Later that day, pitchers Thad Weber, Adam Wilk and infielder Danny Dorn made a visit to Toledo Children’s Hospital. They played air hockey & foosball with some of the patients and handed out autographed baseballs. They were even spotted hanging out with some chipmunks! ST. PETERSBURG, Fla. — Minor League Baseball™ Charities announced today that it has created a community service award that will bear the name of a longtime, former South Atlantic League president. Beginning this year, the John Henry Moss Community Service Award will be presented annually at the Baseball Winter Meetings™ to a club that has demonstrated an outstanding, on-going commitment to charitable service and has exhibited support and leadership within its local community and the baseball industry. He also served as president of the Cleveland County (N.C.) Sports Commission. Gardner-Webb University in nearby Boiling Spring, N.C., named its baseball park John Henry Moss Stadium as a tribute to his long-term relationship with the school and Moss’ many financial contributions to it. This article originally appeared on the official website of the Minor League Baseball. Click here to view the original story. 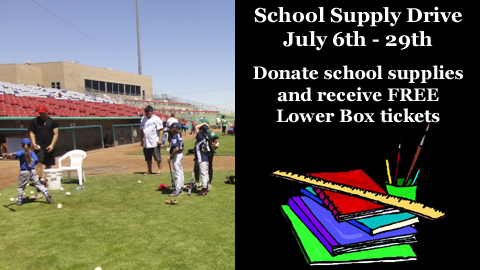 Throughout the month of July, the High Desert Mavericks are collecting school supplies for local students through Desert Communities United Way. Donations will be collected during all home games in July at the Customer Service Corral or the Box Office. For each school supply item donated, fans will receive one free Lower Box ticket. For more information, contact the Front Office at (760) 246-6287. Desert Communities United Way (DCUW) is a local non-profit organization which participates and cooperates with other agencies to coordinate health and human services to best meet the needs of our communities in the Victor Valley. Their offices are located at 16192 Siskiyou Rd. #4 in Apple Valley. 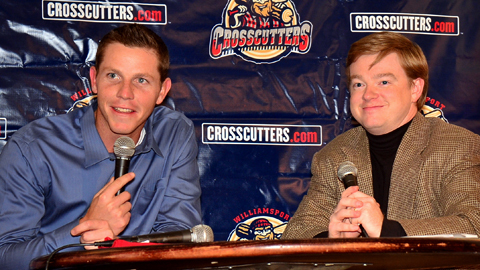 Phillies pitcher Justin DeFratus (left) was one of the featured guests at the Cutters Hot Stove event. With a star-studded guest list and a jam-packed Genetti Ballroom, the Williamsport Crosscutters 7th Annual Hot Stove Banquet was a great success while raising over $4,000 for charity. On a snowy winter night in Williamsport, Phillies pitcher Justin DeFratus, 2-time Cy Young Award winner Denny McLain, local hero Tom O’Malley & Phillies front office personnel entertained attendees with stories and answered audience questions. The night, presented by HB Rentals, Woodlands Bank, WRAK Radio and the Williamsport Sun-Gazette, was also highlighted by live and Chinese auctions that featured a wealth of sports memorabilia including a bat signed by Phillies all-star first baseman Ryan Howard, baseballs signed by Phils catcher Carlos Ruiz, pitcher Cole Hamels, hall-of-famers Rod Carew, Dave Winfield and many others. 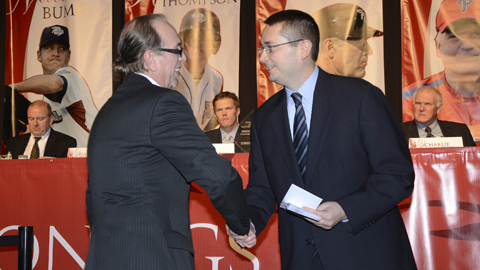 Other highlights of the event included the induction of Lou Hunsinger, Jr. into the Bowman Field Hall of Fame. Hunsinger, the President of the Bowman Field Commission and longtime baseball historian was part of a group that helped salvage hundreds of historic baseball photos in danger of being lost to posterity from the files of The Grit newspaper and publishing company. Through those efforts, the Grit Baseball Photograph Collection was donated to the James. V. Brown Library and subsequently inventoried, organized and cataloged. A portion of the proceeds from the evening were donated to YWCA of Northcentral PA whose mission is dedicated to eliminating racism, empowering women and promoting peace, justice, freedom and dignity for all. At the conclusion of the festivities, the YWCA was presented with a check for $4,075. The Crosscutters 15th anniversary season opens on June 18 at Historic Bowman Field. Season tickets, bonus books and group packages are currently available and can be purchased online at ww.crosscutters.com or by calling the Cutters at (570) 326-3389. The state-of-the-art Sands Bethlehem Events Center, a spacious 50,000 square foot venue, opened earlier this year on the Sands Casino Resort Bethlehem campus and has already hosted a wide array of premier musical acts, comedians and sporting events. The events center is directly located adjacent to the Sands Hotel. Winter Banquet attendees may enter at any of the Sands Boulevard entrances off 3rd Street and follow the signs directing you to the rear of the hotel. To renew or order season tickets, mini plans or group tickets for the 2013 IronPigs season presented by Capital BlueCross, call (610) 841-PIGS (7447) or visit Coca-Cola Park’s ticket office during normal business hours. 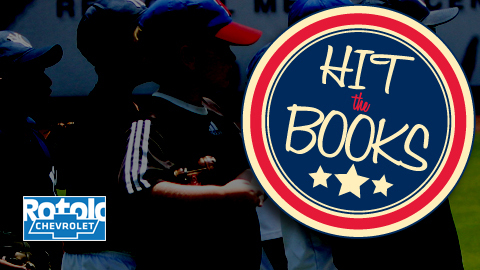 San Bernardino, CA– The Inland Empire 66ers are on a mission to visit area elementary schools in the upcoming months to promote the importance of reading, through their Hit the Books Reading Program presented by Rotolo Chevrolet. The organization’s community relations team, alongside lovable mascot Bernie, will hold assemblies at participating schools which will culminate in each student receiving a baseball themed bookmark. When the student reaches the reading requirement, they will earn two free tickets to a selected 66ers game. The selected 66ers games in which the students will be invited are the first four Sundays of the 2013 season (April 7, April 21, May 12 and May 19). Three monetary donations will be made to the schools with the highest representation throughout the four days. The school with the most students and teachers attending these games will receive a donation of $1,500. The two schools in second and third will receive a donation of $1,000 each. For more information on the Inland Empire 66ers 2013 education initiatives, contact Kelsey Beckenbach at 909-495-7658. The 2013 season will kick off on Thursday April 4, 2013 at San Manuel Stadium when the 66ers take on the Modesto Nuts. Inland Empire fans can now purchase season ticket and group packages for the 2013 season. 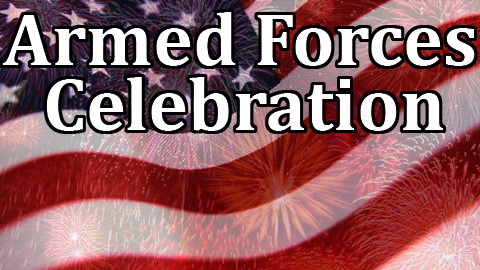 Tickets can be purchased by calling 909-888-9922. Additional information is available online at www.66ers.com. For more information on the Inland Empire 66ers please contact Joey Seymour, Director of Ticket Operations and Media Relations, at 909-495-7638. This article originally appeared on the official website of the Inland Empire 66ers. Click here to view the original story. 2014 School Celebration Days are fun and educational! 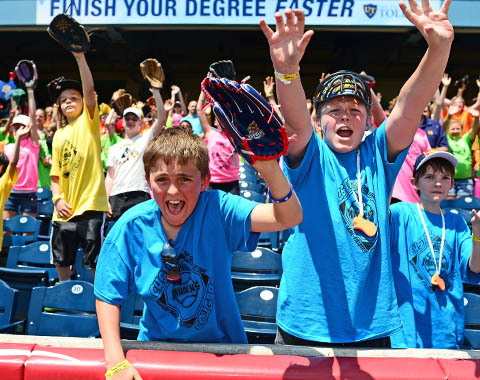 All public and private high school, junior high and elementary students, educators, teacher’s aides, chaperones and bus drivers are invited to the 2014 Mud Hens School Celebration Days.Three dates to choose from in the 2014: Monday, May 12, Wednesday, May 14, Wednesday, May 28. To place your order over the phone contact Brock Chambers at 419-725-9258 or make your reservations by e-mail at bchambers@mudhens.com. Salisbury, Md. 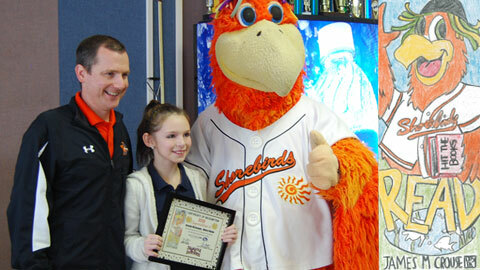 – The Delmarva Shorebirds named Kassidy McConaghy of Milford Middle School the winner of the 2013 Hit the Books Bookmark Contest on Tuesday. Sherman and Shorebirds staff members presented Kassidy with her award during lunch hour at Milford Middle School. McConaghy’s winning bookmark design will be distributed to all participating students in the Hit the Books program. Over 40,000 students from over 100 schools are involved in this years program. The Hit the Books Program, sponsored by Dr. James M. Crouse at The Brace Place, is an initiative to encourage reading outside the classroom. Students that read four or more books outside the classroom receive two free Shorebirds tickets. Sherman the Shorebird will be making appearances to select participating Hit the Books school over the next two months to encourage students to read. For more information about the program, contact Shawn Schoolcraft at 410-219-3112 ext. 168.